Put forward as a dedicated target load, this is more than just a regular target load. But as a target load it is exceptional. 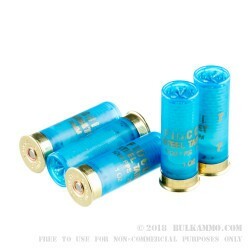 The #7 shot included in this shell is a steel-based shot that is packaged as a 1 ounce payload in a standard sized 2 ¾” shell that pumps out a velocity of 1200 feet per second. The use for small game is an obvious choice as well, with many animals and small birds able to be taken with this cartridge. 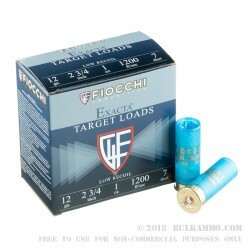 The Fiocchi brand is known for its well-priced, well-placed ammunition offerings, and has one of the largest breadths of any producer across their shotgun sporting lines. This is the Exacta line of shotshells. 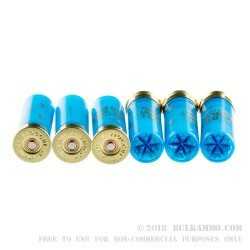 The easy to recognize bright blue color of the hulls and the low brass base make this an easy integration into your range bag, without offering something that is too much of a concern – the low brass will still function in the mainstream semi-autos (though reloading may not be as easy for some of the rounds). 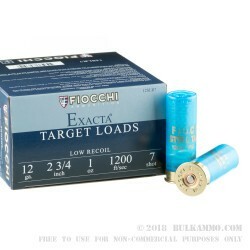 The reloadability is probably overkill, because the pricing of this round makes reloading almost not make sense. The various features and benefits of this design however do show Fiocchi’s commitment to the hunter, sport shooter and to the innovation of their portfolio as they move forward as one of the worlds best production companies in the ammunition market.